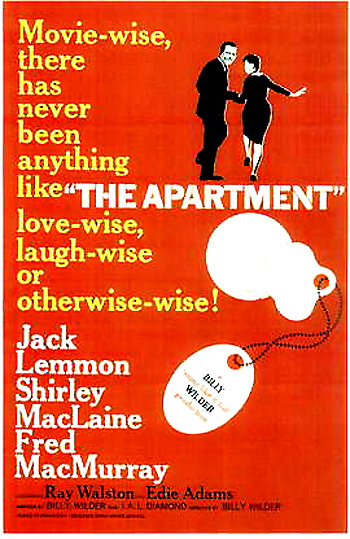 The Best Picture Award winner was director/producer/writer Billy Wilder's cynical and risque black and white comedy/tragi-drama The Apartment (with a total of ten nominations and five wins - Best Picture, Best Director, and Best Writing: Story and Screenplay, Best B/W Art Direction, and Best Film Editing). It was an indictment of corporate politics. It told about an ambitious, lonely insurance clerk (Jack Lemmon) who lends out his NY apartment to higher executives for their clandestine, illicit affairs. His married boss's (Fred MacMurray) girlfriend and elevator operator (Shirley MacLaine) is so depressed about her own involvement that she attempts suicide. Wilder's Some Like It Hot (1959) was mostly overlooked the previous year, so the Academy made up for the oversight this year. [It was an unprecedented triple win for Wilder - three Oscars for co-writing, producing, and directing the same film. The last time a triple win had occurred was director Leo McCarey's win for Going My Way (1944), but in 1944, the Best Picture award wasn't yet given to individual producers. It would also occur for Francis Ford Coppola in 1974, James L. Brooks in 1983, and James Cameron in 1997.] 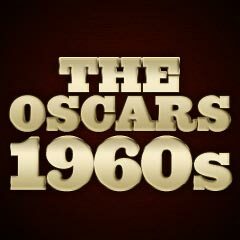 It was remarkable that none of the three nominated members of the acting cast (Lemmon, MacLaine, or Kruschen) of the Best Picture winner won an Oscar. producer/director/actor John Wayne's overlong, big-budget, turgid American epic about the 1836 battle for independence, The Alamo (with a total of seven nominations and only one win - Best Sound) - Wayne had tirelessly campaigned for the tepid film, suggesting with ads that it would be unpatriotric not to vote for the film - "the most expensive picture ever made on American soil"
The Best Director nominees Alfred Hitchcock (for Psycho - this was the famed director's fifth and last unsuccessful nomination in this category) and Jules Dassin (for Never On Sunday - this was his sole Best Director nomination) replaced Best Picture-nominated directors John Wayne (for The Alamo) and Richard Brooks (for Elmer Gantry) in that category. The Best Actress category (with two prostitutes and a mistress among the nominees) was won by Elizabeth Taylor (with her fourth of four consecutive nominations and her first Oscar win) as part-time model and wanton, fast-living, disturbed call-girl Gloria Wandrous caught in a doomed romance with a wealthy married man (Laurence Harvey) and her love for her disapproving friend (Eddie Fisher) in the trashy Daniel Mann film based on John O'Hara's novel, Butterfield 8 (with two nominations and one win - Best Actress). The title of the picture was derived from her answering services' telephone exchange - Butterfield. Violet-eyed Taylor's win for the widely-panned melodramatic film is often interpreted as a sympathy vote because she had lost in the three previous years, and she had just endured an emergency tracheotomy during a near-fatal bout of pneumonia, and had throat scars to prove it. London-born Peter Ustinov (with his second of three career nominations - and his first of two Oscar wins - he was previously nominated for his supporting role in a similar epic Quo Vadis? (1951) ) won the Best Supporting Actor award as a wily, greedy Roman slave trader-master Lentulus Batiatus who trains Kirk Douglas in a gladiator school in Stanley Kubrick's tale of a slave revolt, Spartacus (with six nominations and four wins - Best Supporting Actor, Best Color Cinematography, Best Color Art Direction/Set Decoration, and Best Color Costume Design). The Honorary Oscar award was awarded to a gravely-ill Gary Cooper this year, "for his many memorable screen performances and the international recognition he, as an individual, has gained for the motion picture industry." He had received five Best Actor nominations in his career from 1936 to 1952, and won two Oscars - Sergeant York (1941) and High Noon (1952). Cooper died a month after the awards ceremony (April 17, 1961), on May 13, 1961. Stan Laurel also received an Honorary award for "his creative pioneering in the field of cinema comedy." Janet Leigh received only one Oscar nomination in her career, for Psycho - which she lost! Other memorable unnominated roles included her role as Charlton Heston's terrorized wife Susan Vargas in Orson Welles' Touch Of Evil (1958) or as Rosie, Frank Sinatra's love interest in John Frankenheimer's The Manchurian Candidate (1962). Likewise, 1960 was the year for Trevor Howard's sole nomination in a career with many outstanding but un-nominated acting roles, such as in Brief Encounter (1946) and The Third Man (1949). It was appalling that Best Picture-nominated The Alamo edged out Hitchcock's superior thriller Psycho (with four unsuccessful nominations) and Stanley Kubrick's Spartacus for Best Picture nominations. This was Hitchcock's fifth nomination as director (from 1940-1960) - he would never be nominated again for Best Director. Both Montgomery Clift and Jo Van Fleet were denied nominations as TVA agent Chuck Glover and as evicted 80 year old widow Ella Garth in Elia Kazan's issue-oriented drama Wild River, and Alec Guinness was likewise ignored in the nominees as brutal and crude Lt. Col. Jock Sinclair in director Ronald Neame's Tunes of Glory. Fredric March was neglected for his performance as Matthew Harrison Brady opposite nominated Spencer Tracy in Inherit the Wind. And Doris Day was omitted as a Best Actress nominee for one of her few (and last) dramatic roles as the hysterical and threatened Kit Preston in the Hitchcock-like mystery thriller Midnight Lace (with only one nomination for Best Costume Design). Jean Simmons, who played Varinia - a slave girl loved by Spartacus, was denied a nomination (opposite the powerhouse performance of Best Actor-winning Burt Lancaster) for her part as devout evangelist Sister Sharon in Elmer Gantry - the film also lacked a nomination for its first-time director Richard Brooks. Director Otto Preminger effectively ended the blacklisting of Dalton Trumbo, by putting the writer's real name on the screenplay for Exodus. (Trumbo, under the pseudonym of Robert Rich, won the Best Writing: Original Story Award (his second and last nomination and sole Oscar win) for The Brave One (1956).) And finally, why wasn't Fred MacMurray nominated in a supporting role as a cad businessman in The Apartment instead of Jack Kruschen?